Osteoarthritis (OA) is characterised by chronic localised joint pain, stiffness, joint deformity and loss of joint mobility and is a leading cause of disability worldwide, affecting at least 50% of elderly people, and also younger individuals following injury. The incidence and prevalence of OA is expected to increase with the aging population. Treatments in OA focus on managing pain, as this interferes with physical activity, and impacts on cognitive and emotional function. However many patients experience insufficient pain control, and experience delays in finding the best management strategy for them. 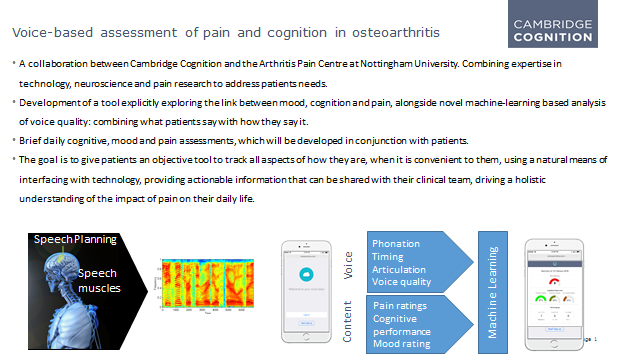 This project is a collaboration between Cambridge Cognition and the Arthritis Pain Centre at Nottingham University, combining expertise in technology, neuroscience and pain research to address patient needs. We are aiming to develop of a tool explicitly exploring the link between mood, cognition and pain, alongside novel machine-learning based analysis of voice quality: combining what patients say with how they say it. Humans express and assess subjective physiological states such as pain through both content of speech and features of the voice, such as rate of word production, fluency of speech and tone of voice. Previous research found that changes in acoustic features of the voice are linked to changes in subjective pain and demonstrated that machine-learning algorithms can differentiate speech samples taken from people with and without pain. In conjunction with patient groups, we will develop brief daily cognitive, mood and pain assessments, which, alongside passive data from smartphone sensors, provide an engaging method for the tracking of pain symptoms and their impact of pain on daily life. The goal is to give patients an objective tool to track all aspects of how they are, when it is convenient to them, using a natural means of interfacing with technology, providing actionable information that can be shared with clinicians.